It uses its weight to trip much larger enemies. It is as dense as a star. 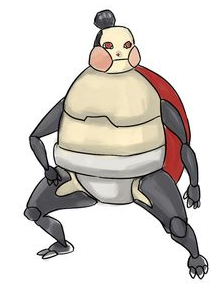 Sumchon, the Wrestling tuxemon, is a Metal-type, Wood-type monster. Original design by tamashihoshi. Redesign and art by Leo. Sprites by tamashihoshi. This page was last modified on 31 March 2019, at 11:00.